Mladjan Janovic of Montenegro shoots the ball against Emmanouil Mylonakis of Greece. 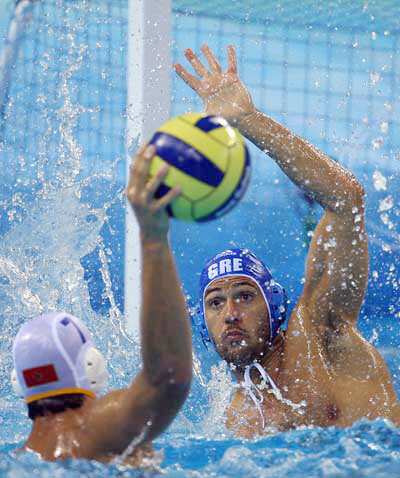 Rafael Aguilar, coach of Spain gives instruction to his team members in their men's waterpolo match against Hungary at the 2008 Beijing Olympic Games, on August 14, 2008. Hungary won the match 8-5. The Australian team dives into the pool to take on the Canada in their men's water polo match at the 2008 Beijing Olympic Games, on August 14, 2008. Australia defeated Canada 8-5.
mislim da je aleksandar ivović potpisao za jug. odličan je.